The term vintage seems to bring you back to the classical lines that were in fashion decades ago, but not in the universe of Franc Vila. What he calls vintage, most brands would refer to as progressive especially in terms of styling. But when you compare the Intrepido case style to the even more unusual Franc Vila Cobra, you start to understand the reasoning behind the use of the word “vintage” in this model. Even more so when you realize that this watch features one of the oldest and purest ways to display the chronograph function, in the Bicompax setting. Two subdials, with the running seconds on the right and the minute counter on the left, dominate the center of the dial, while a larger than usual date wheel positioned at six o’clock. Another reason why the word vintage might seem a bit off is the vivid use of color in the watch. A bold combination of bright blue and red details will stun those who have an image in gold tones with brown straps in their minds while thinking of something vintage. 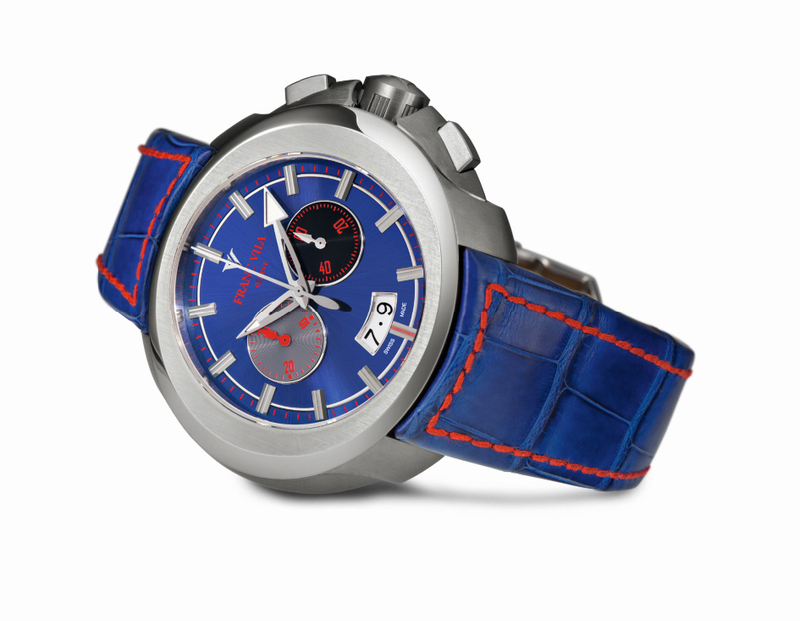 This vibrant color combination gives the Intrepido a very sportive look, and make it even more of an eye catcher. Despite all this visual spectacle, the main draw to any Franc Vila, and this is no exception, has to be the unusual shape of the case. It is one of the very few watches that features an oval case, sharing the ranks with the Audemars Piguet Millenary and the Piaget Gouverneur. Yet while these watches are more suited for dressier occasions, the Intrepido makes no secret of the fact that it is also perfectly capable of handling more sportier events. The bezel is made of, what Franc Vila calls, DieHard Extreme Steel, a type of steel that has received additional treatments in order to achieve extreme hardness. The rest of the case is titanium, and the watch is fitted with two sapphire crystals, which are equipped on both sides with an anti-reflective coating for perfect visibility under all conditions. On the back side of the watch this allows for a clear view of caliber FV17 which features Franc Vila’s exclusive “Gold Concept Rotor”.The Vintage Chrono Bicompax Intrepido will be made in a limited edition of 88 pieces.